Think Black, Speed, Death, Thrash….or any kind of extreme subgenre of heavy metal music and you are probably not going to see a Butterscotch Tele on stage….horses for courses of course. The theatrical approach that metal bands deliver live, is all part of the visual concept that’s pure entertainment. 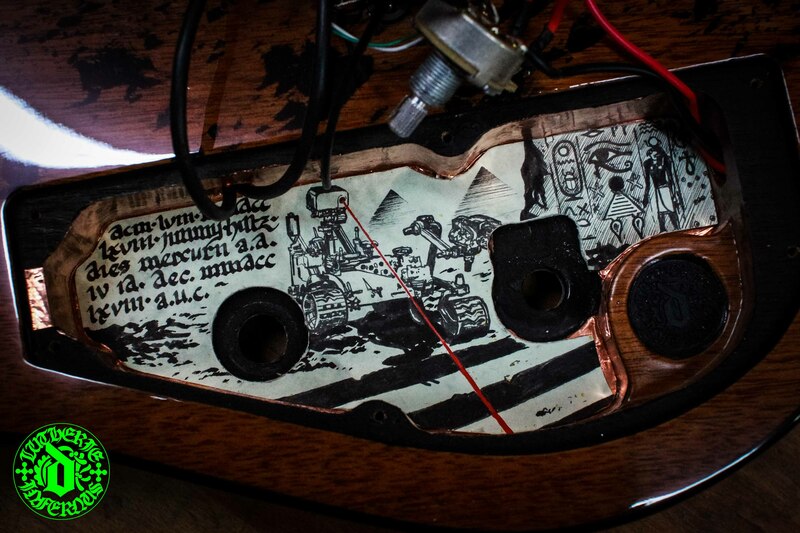 Lightning sweep picking aside, 20ft laser eyed gargoyles, dragons, flames and Odin and Thor-like guitar players getting their hair caught in each other’s machine heads (I’ve been there! 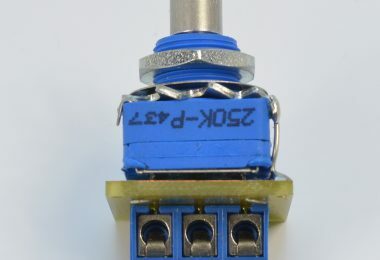 ), are all part of the act. Chances are, said guitarist’s choice of sonic warfare will have no less than 7+ strings tuned down a step or two and played through a line of scooped angry amps. 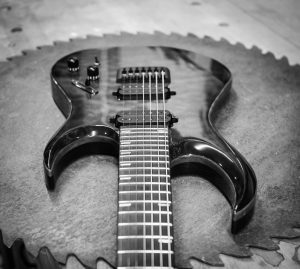 Whilst most guitar manufactures have a metal themed guitar in their catalogue with impressive inlays and finishes, several are massed produced, others are painstakingly built by hand by skilled luthiers. 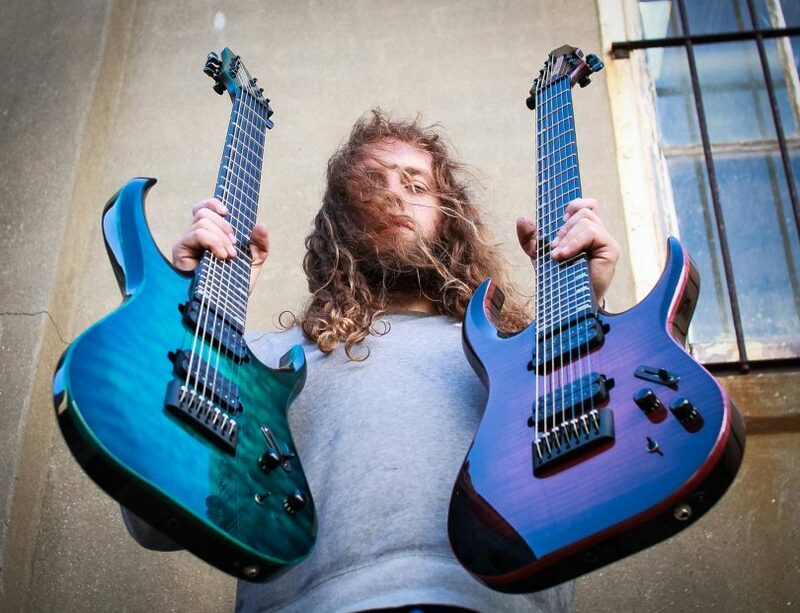 I asked Dylan Humphries, luthier and owner of Dæmoness Guitars what differentiates his hand-built metal themed guitars from the others. 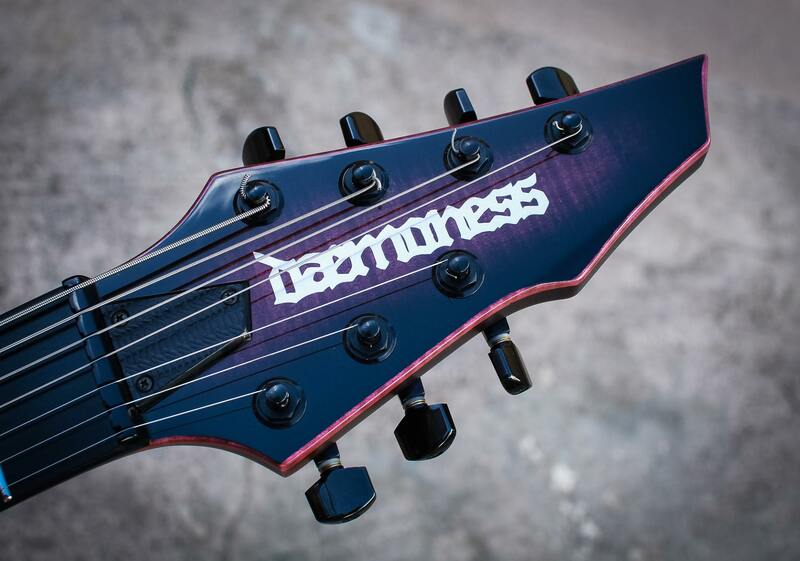 “Dæmoness Guitars are heavy metal guitars uncensored,” says Dylan. “Simple as that. 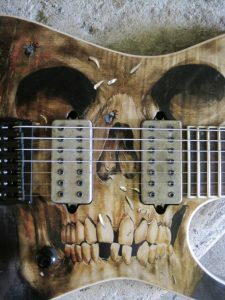 Of course, we wouldn’t have heavy metal guitars if it wasn’t for the likes of Jackson, Ibanez and Schecter to name but a few, but the intellectual concept behind them has always been far too tame, the deadliest image I’ve seen on a body is a Reaper….whoopee do! For me, the metal scene started some 40 years ago with Tony Iommi and his SG. Since then there have been so many ideas within body shapes and technology that have either sunk or swam. I’ve taken all the bits that swam and added my own slant within craftsmanship, playability and hardware using architectural formulas within my designs. 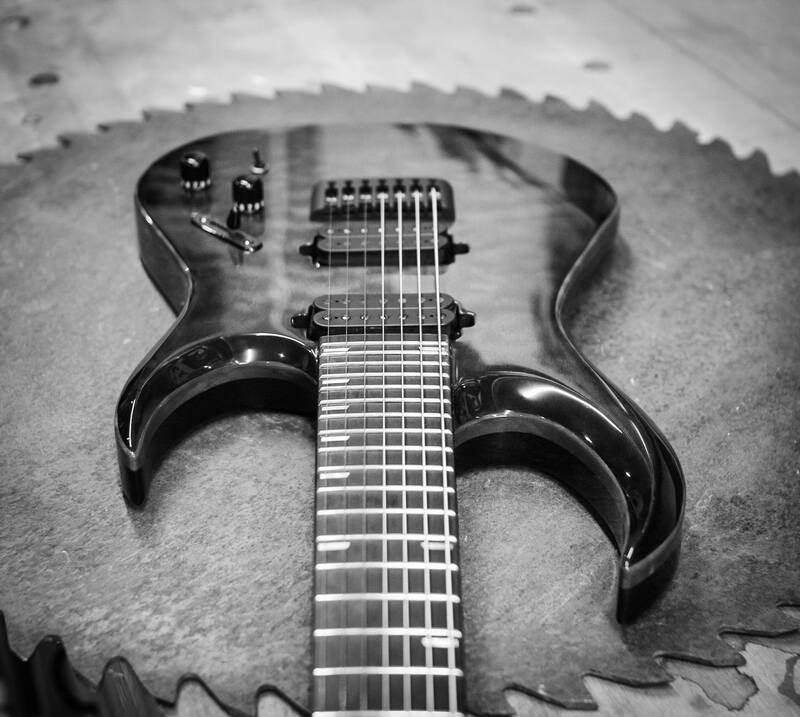 When I started Dæmoness Guitars around 2007, I wanted to make guitars that had all the best parts in one guitar and take that to the next level, I believe this is why we are so successful. I’m building for some of the world’s best metal players, there are no barriers or limits within the artwork or themes. “All my life I’ve been chasing artistic ideas and visions from my childhood from watching and learning from my Dad. Like him, as an artist, I became very thorough and accurate which is reflected within the artwork on my guitars. I grew up during the early 80’s watching him do the artwork for books called The Doom Of The Gods and The Curse Of The Ring, all about Viking mythology. He also trained as a theatre costume maker, so we’d have models arrive at our damp old stone cottage, geographically isolated in North Devon. They’d be wearing Viking battle gear, cloaks, swords and battle axes, all that kind thing. This was an influence that has now become a passion. I think if you do artwork of any kind it has to mean something, a lot of the themes on my guitars are the signs of the time rather than a happy go lucky ‘everything’s fine’ attitude. First impressions of Dæmoness guitars without doubt are the stunning finishes and artwork designs. “You can look at art and you either get it or not get it, or care for its message. When I create my pictures either on canvas or on my guitars there’s an authenticity and a point to it. So much artwork in our society really has no point at all. 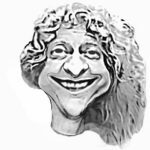 I try to get as accurate and authentic as I can to the middle ages which is so hard to do, as so many elements of modern art and artistic thinking subtlety creep into everything you do. “I’m a big student of design and craft but not of the modern era. 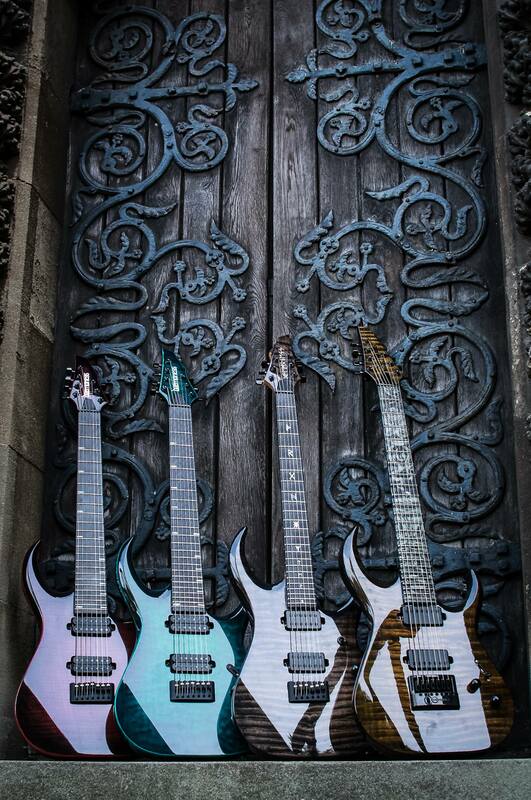 This is reflected heavily in the body designs of my guitars, especially my best selling model called the Cimmerian. Without going into too much detail, the bodies and curves of my guitars are created using the same architectural formulas and ratios as used by the Romans the ancient Greeks and the Renaissance, which I tie into the curves in the designs. This is the glue that holds together all the elements that have been brought from the metal guitar scene to Dæmoness Guitars. The Cimmerian is accountable for about 80% of our sales with a body designed based on a Superstrat, arguably the coolest body shape ever. 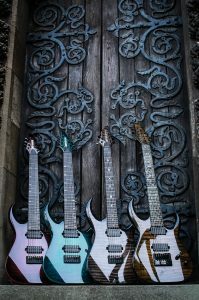 It’s offered as a 6, 7 and 8 string with optional hardware and spec and of course, individual personal artwork and advanced inlay designs using metal powders and resins. Like my artwork, the Cimmerian body contour is an example of a depth to Dæmoness Guitars which is enduring and based on cultures that produce things which are timeless. I’m very good at planning and foreseeing the building process in my head and the individual spirit I’m going to give the guitar. 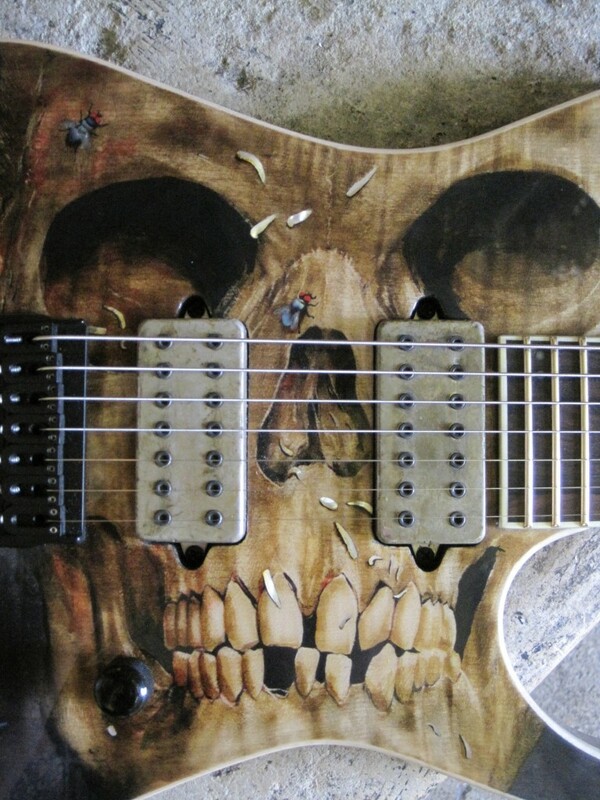 There are so many individual intricacies of guitar making that no one else can produce. Even the types of curves carpenters put into their work, to a certain degree, are dictated by how tall they are, how long the bones of their forearms are or the length of their fingers, or even how they twist their bodies. With so many fine details from start to finish that include hand shaping the bodies from scratch, to the inlays and installing the hardware, Dylan is on track to produce a record numbers of guitars by the end of the year. “We have a huge waiting list but, I’m not wearing that as a badge of honour by any means”, he says. 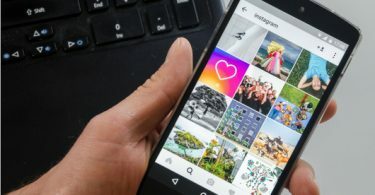 “No one is more frustrated by the waiting time than me. I’m trying to fulfil the commissions as soon as possible, although I can only respond at a certain rate. We are on track to make a record 60 guitars this year. The only part of the process that we outsource is the spraying of the lacquer. I did all my own lacquering for the first five years so I completely understand the process, but the environment would shut us down instantly here in the middle of Bristol if we had a spray booth. Whilst I’m getting great results from basswood, maple and mahogany are my favourite woods to work with. I can relate them to a sculptor’s clay rather than timber. I get a lot of my hand tools and guitar parts from Bill Quinn at Tonetech Luthier Supplies, including fret wire and carbon fibre rods to reinforce the guitar necks which increase sustain and stability. We have some special announcements to make soon about artist endorsements which are under the radar at the moment. With so many high profile metal players, the likes of Jari Mäenpää from Finnish metal band Winter Sun, who has his own signature Dæmoness model, the Norwegian black metal band 1349 and Soreption from Sweden, I think it says it all really.